Aside from the stunning Q60 Project Black S, Infiniti also unveiled the 2018 Q50 during the ongoing Geneva Motor Show. The sedan’s mid-cycle refresh includes revisions to the car’s exterior and interior, along with the addition of new technologies. The GT and Premium trim levels have been omitted with the new car, and in its place is a new variant structure that begins with the Pure, followed by the Luxe, Sport, and the range-topping Red Sport 400. The Q50 retains its familiar profile but receives new front and rear bumpers, where the former is joined by a reshaped lower air intake and a more detailed grille. Other changes include new LED headlights and new fog lamps, the latter positioned within a redesigned enclosure. At the back, the Q50 gains new taillights that are slimmer than those on its predecessor, while the lower section accommodates a diffuser element and the dual exhaust pipes. 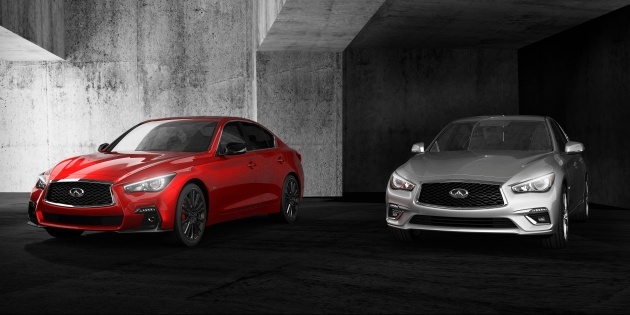 Performance variants of the Q50 like the Sport and Red Sport 400 will get certain cues to distinct itself further. For starters, both will get a more angular front bumper, which is highlighted by the different-sized lower intake, diamond-pattern mesh, and lip. Other differentiating details can be found in the rear, with the performance variants benefitting from more intricate exhaust pipes. Moving inside, the Q50 now comes with a new steering wheel and gear lever, which is similar to the one found in the Q60 coupe. In other areas, the instrument panel now receives a double-stitched faux leather covering, and new “spinal support seats” keep passengers comfortable. Red Sport 400 models get extra goodies, including red contrast stitching in many parts of the cabin, as well as quilted side inserts on the seats and a matte chrome finish for the trim around the gauges. Infiniti’s InTouch infotainment system continues to be of service here, as is the dual screen setup. Engine options continue to include the existing petrol line-up, with a 2.0 litre turbo four-cylinder (208 hp/350 Nm), 3.0 litre twin-turbo V6 in two states of tune (400 hp/475 Nm and 300 hp/400 Nm), and a 3.5 litre V6 hybrid (360 hp). For those who require an oil burner, there’s also a 2.2 litre diesel (168 hp/400 Nm) available. Depending on the mill, a six-speed manual or seven-speed auto can be specified, as well as all-wheel drive (standard rear-wheel drive). GENEVA (Mar. 7, 2017) – INFINITI has enhanced the Q50 premium sports sedan, which makes its global debut at the 2017 Geneva International Motor Show. The new Q50 features refreshed exterior and interior design, and innovative technologies designed to empower and support the driver. Best looking car in its class…. couldn’t agree more! it’s the most underrated car here. Ini brand tak relevan @ Bolehland..
Tak relevan? Well i guess ur comment isnt relevant here. U are talking to a Q50 owner here.